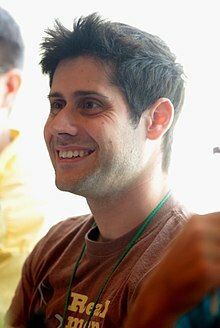 Benjamin Isaac Diskin (born August 25, 1982) is an American voice actor. In 1993, when he was 10 years old, he provided the voice of title character Junior Healy in the USA Network's animated series Problem Child. He would later voice characters in cartoons such as Eugene in Hey Arnold!, Numbuh 1 and Numbuh 2 in Codename: Kids Next Door, Humphrey in the Alpha and Omega sequels, and Eddie Brock in Spectacular Spider-Man. In English dubs of Japanese anime shows, he voiced Sai in Naruto Shippuden, Shoutmon and Cutemon in Digimon Fusion, Joseph Joestar in JoJo's Bizarre Adventure, and Ban in The Seven Deadly Sins. In video games, he voices Young Xehanort in the Kingdom Hearts games, Eric Sparrow in the Tony Hawk's series, and Jusis Albarea in The Legend of Heroes: Trails of Cold Steel. Diskin has appeared in The Wonder Years, Hey Arnold!, Disney's Recess, Mr. Saturday Night, Kindergarten Cop, Baby Boom and Just Like Dad. He also voiced Hahn in Avatar: The Last Airbender and Eddie J. Squirrel in Squirrel Boy. Diskin recently played Arashi Fuuma on Naruto, Sai in Naruto Shippuden, Kai Miyagusuku and Katao in Blood+, and Eddie Brock/Venom in The Spectacular Spider-Man. He voiced the Disney character Stitch in the English versions of the anime series Stitch! and the Chinese animated series Stitch & Ai, taking over from the character's creator and original voice actor Chris Sanders. He voiced Haida in the English dub of the Netflix original series Aggretsuko. He will be voicing Jay in the upcoming visual novel game Lovely Little Thieves, which is currently in the process through a Kickstarter campaign. 2018 The Flash Ep. "The Elongated Knight Rises"
^ "CESD". cesdtalent.com. Retrieved January 18, 2017. ^ "Ben Diskin's Official Fanpage - About - Facebook". facebook.com. Retrieved February 13, 2017. ^ "Ben Isaac Diskin (personal FB)". www.facebook.com. Retrieved January 1, 2018. ^ a b c "Exclusive: KHInsider Interviews Ben Diskin! - News - Kingdom Hearts Insider". khinsider.com. Retrieved February 13, 2017. ^ Brooks, Tim; Marsh, Earle F. (June 24, 2009). "The Complete Directory to Prime Time Network and Cable TV Shows, 1946-Present". Random House Publishing Group. Retrieved February 13, 2017 – via Google Books. ^ Ritter, Jeff (August 10, 2009). "DVD Review: The Spectacular Spider-Man: The Complete First Season". The Trades. Archived from the original on March 21, 2012. Retrieved December 25, 2010. ^ "Old School Lane's Nickelodeon Tribute: Interview with Ben Diskin". manic-expression.com. July 28, 2014. Retrieved February 13, 2017. ^ "New Cast Announcement + Livestream Today!". Kickstarter. Hope Chapman (PangoDango Games). November 8, 2014. Retrieved November 8, 2014. ^ a b c d e f g h i j k "Anime Conji Guests - Ben Diskin". Anime Conji 2015. Archived from the original on April 5, 2015. Retrieved April 5, 2015. ^ a b c d e f g h i j k "AnimeCon Arkansas 2015 guests". AnimeCon Arkansas 2015. Retrieved March 18, 2015. ^ a b c d e f g h i j k l m n o p q r s t u v w x y z aa ab "Behind The Voice Actors – Benjamin Diskin". Behind The Voice Actors. Green check mark indicates roles that have been verified by BTVA through closing credits screenshots. Retrieved September 19, 2017. ^ "Viz Media Announces K TV Anime's Dub Cast". June 14, 2013. Retrieved July 16, 2014. ^ Benjamin Diskin [@BenDiskin] (July 4, 2014). "Me and my Kill la Kill character, Takaharu Fukuroda" (Tweet). Retrieved May 9, 2015 – via Twitter. ^ Netstryke [@Netstryke] (May 5, 2015). "This Saturday... #HereComesTheZeni! @BenjaminDiskin is Kaneo "Zeni" Takarada! #KilllaKill Sat" (Tweet). Retweeted by Ben Diskin. Retrieved May 9, 2015 – via Twitter. ^ Bugeja, Kane (August 18, 2014). "Staz Attacks in Blood Lad's First Dub Trailer". snapthirty.com. Retrieved January 18, 2017. ^ "Viz Media Announces Blood Lad's English Dub Cast". May 16, 2014. Retrieved July 15, 2014. ^ "New Sailor Moon Dub Cast Revealed at Anime Expo". Anime News Network. July 5, 2014. ^ Diskin, Ben (April 23, 2015). "To those of you who correctly guessed that I was the voice of Death Gun, pat yourselves on the back. Then, immediately take BACK that back-pat for letting me fool you again!! XD". Facebook. ^ Benjamin Diskin [@BenDiskin] (April 4, 2015). "Hey, guys! Check me out as Ginrou in Sword Art Online tonight on Toonami!! #SAOtoonami" (Tweet). Retrieved May 9, 2015 – via Twitter. ^ "Director of Jojo's Bizarre Adventure Coming to AX for World Premiere of English dub". Anime Expo.org. Retrieved June 9, 2015. ^ Benjamin Diskin [@BenDiskin] (November 1, 2015). "There were SO many times @BrycePapenbrook cracked me up as Meliodas on #SevenDeadlySins. It's now on @netflix! (Also, I play Ban. ;-) )" (Tweet). Retrieved November 1, 2015 – via Twitter. ^ "Main Cast for Mobile Suit Gundam the Origin II [English Dub]". Gundam-The-Origin.net. Retrieved September 8, 2015. ^ "Viz Media Reveals More English Dub Cast for Sailor Moon R Anime". April 3, 2015. Retrieved April 4, 2015. ^ Ben Diskin [@BenjaminDiskin] (October 14, 2015). "I'm so excited to announce that I'm voicing a bunch of background characters in #GlitterForce which is coming to @Netflix on 12/18/15! :-D" (Tweet). Retrieved February 24, 2016 – via Twitter. ^ "One-Punch Man Is Coming to Toonami!". Viz Media. Retrieved July 14, 2016. ^ "The Strongest Man". One-Punch Man. Episode 1. Viz Media. July 16, 2016. Adult Swim. ^ "The Lone Cyborg". One-Punch Man. Episode 2. Viz Media. July 16, 2016. Adult Swim. ^ "Ben Diskin, Michelle Ruff Star as Satoru in Erased English Dub". Anime News Network. June 29, 2016. Retrieved June 30, 2016. ^ "Exclusive: B: The Beginning Anime's English Dub Cast Revealed". Anime News Network. October 20, 2017. Retrieved January 24, 2018. ^ "Promise × And × Reunion". Hunter × Hunter. Episode 86. Viz Media. March 3, 2018. Adult Swim. ^ "Aniplex USA Announces Katsugeki Touken Ranbu's Blu-Ray Set, English Dub Cast". April 3, 2017. ^ "Idiot's Array". Star Wars Rebels. January 19, 2015. Event occurs at 22:00. Disney XD. ^ Cavanaugh, Patrick. "Check out these Guest Voices from Marvel's Ultimate Spider-Man: Web Warriors". marvel.com. Marvel.com. Retrieved September 6, 2014. ^ "Contest of Champions, Part 2". Ultimate Spider-Man. Season 3. Episode 24. October 10, 2015. Disney XD. ^ "The Eileen Plan". Regular Show. Season 7. Episode 16. November 13, 2015. Cartoon Network. ^ "Lego Marvel Super Heroes: Avengers Reassembled". Lego Marvel Super Heroes. November 16, 2015. Event occurs at Closing credits. ^ Terrace, Vincent (December 14, 2017). "Encyclopedia of Television Shows: A Comprehensive Supplement, 2011-2016". McFarland. p. 110. ISBN 9781476671383. Retrieved August 6, 2018 – via Google Books. @Kitsunes96 (October 21, 2018). "@BenjaminDiskin Was it you voices Max, Nooroo and Sass from Miraculous: Tales of Ladybug & Cat Noir or no?" (Tweet). Retrieved October 26, 2018 – via Twitter. Diskin, Ben [@BenjaminDiskin] (October 21, 2018). "That's me, yes!" (Tweet). Retrieved October 21, 2018 – via Twitter. ^ "Takao" (February 13, 2018). "Stitch & Ai debuts in South East Asia". ToonBarn. ^ "Brussel Boy". Bunnicula. Season 1. Episode 33. September 28, 2017. Boomerang. ^ "Trading Post". Danger & Eggs. Season 1. Episode 9. June 30, 2017. Amazon. ^ Swift, Andy (February 6, 2018). "Muppet Babies Reboot: Jenny Slate to Voice the Iconic, Faceless 'Miss Nanny'". TV Line. Retrieved March 29, 2018. ^ Amidi, Amid (April 12, 2018). "TRAILER: New DreamWorks Version of 'The Adventures of Rocky and Bullwinkle'". CartoonBrew. ^ "Viz Media to Release Sailor Moon R Anime Film In U.S. Theaters In January". Anime News Network. November 11, 2016. Retrieved November 12, 2016. ^ Bertschy, Zac (November 15, 2016). "Interview: The Cast of Sailor Moon R: The Movie". Anime News Network. Retrieved January 18, 2017. ^ Mammano, Michael S. (January 18, 2017). "Sailor Moon R: The Movie Premiere Was Immersive Experience For Fans". Den of Geek. Retrieved January 19, 2017. ^ "Viz Reveals English Dub Cast for K: Missing Kings Film (Update 2)". Anime News Network. October 7, 2016. Retrieved October 7, 2016. ^ "Legends of Tomorrow boss previews epic ultimate showdown". Entertainment Weekly. April 6, 2018. Retrieved April 15, 2018. ^ a b "IAmA voiceover actor. My name's Ben Diskin. AMA! • /r/IAmA". reddit.com. Retrieved February 13, 2017. ^ "Cartoon Network Universe: FusionFall". 2010-01-06. Retrieved 2018-08-08. ^ Carbine Studios. WildStar. NCSOFT. Scene: Credits, 2:45 in, Cast. ^ Benjamin Diskin [@BenDiskin] (September 9, 2014). "Is it possible that you're the voice for Q-N-C in the new Sonic the hedgehog game Sonic Boom Rise... — It is. I am!" (Tweet). Retrieved June 26, 2015 – via Twitter. ^ Ben Diskin [@benjamindiskin] (October 19, 2015). "I'm Atakk, Wardell & Amethor in Tales of Zestiria! Knowing I play these ancillary characters will SURELY make you wanna run out and buy it!" (Tweet). Retrieved February 13, 2017 – via Twitter. ^ Monolith Soft. Xenoblade Chronicles X. Nintendo. ^ GameXplain (November 13, 2015). "Xenoblade Chronicles X - All English Voice Options for Player Characters". Retrieved January 18, 2017 – via YouTube. ^ "The Legend of Heroes: Trails of Cold Steel Review (PS3) - Rice Digital". ricedigital.co.uk. January 15, 2016. Retrieved February 13, 2017. ^ Ben Diskin [@BenjaminDiskin] (January 27, 2017). "@FlakeyActor78 Rokurou Rangetsu. I THINK I may have played a background character, but I don't remember too well" (Tweet). Retrieved February 13, 2017 – via Twitter. ^ Sato (January 27, 2017). "Fire Emblem Heroes' Second Character Trailer Has Eliwood, Subaki, Sakura, And More". Siliconera. Retrieved February 25, 2017. @ninjacoachz (April 25, 2017). "@BenjaminDiskin You play Sig and Lemres in Puyo Puyo Tetris, right?" (Tweet) – via Twitter. Benjamin Diskin [@BenjaminDiskin] (April 25, 2017). "Replying to @ninjacoachz Yup!" (Tweet) – via Twitter. ^ Diskin' thru the snow! [@BenjaminDiskin] (February 9, 2017). "@MirbyStudios I believe so!" (Tweet) – via Twitter. ^ Lord Noodle Doodle [@BenjaminDiskin] (August 6, 2018). "I voice Merkava (or, as I call him, "Lord Noodle Doodle") in DLC Pack 4 of @ArcSystemWorksU's BlazBlue: Cross Tag Battle available now! Get out there and slap the competition from the other side of the screen! #BBTAG #NoodleDoodle" (Tweet) – via Twitter. – Diskin changed his displayed twitter name to Lord Noodle Doodle when he posted this Tweet. This page was last edited on 11 April 2019, at 21:24 (UTC).